This indicator uses the chart information and your inputs to display a calculated lot size and associated stop for long or short positions. It uses an ATR based percent volatility position sizing calculation and splits your account equity into two parts, each having its own risk percentage. The concept behind "Market's Money" is using a lower risk percentage for your base account equity and then using a higher risk percentage for any equity above your base equity. This lets you potentially grow your account faster by using a higher risk percentage on your account profits while still maintaining a lower risk percentage on your initial capital. If your account is going through a drawdown and only the base equity threshold is available, the indicator will only use the risk percentage specified for that portion. As time goes along and your profits grow, you can change the amount specified in your base account equity and move some of the market's money to be your money to further protect it. 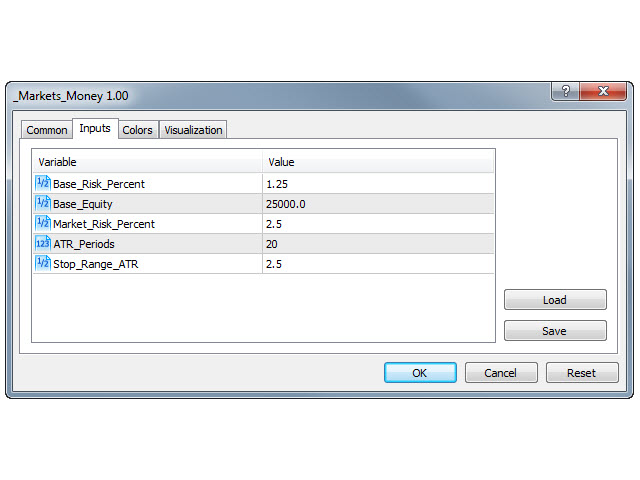 The indicator adds text directly to the chart to show you the inputs you have chosen including base equity, base risk %, market equity, market risk %, the ATR range input, the ATR value from the prior bar, the calculated position size, the account equity at risk if the position is stopped out (does not account for spreads, gaps, or slippage), and the stop levels if going long or short. 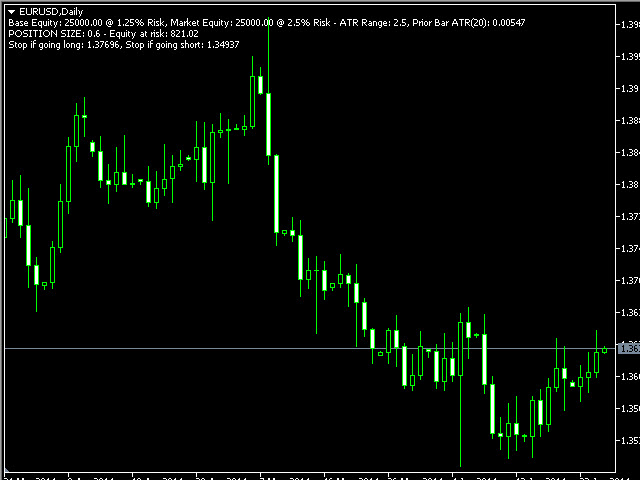 Base_Risk_Percent: The percent to be risked on the base equity in the calculation. If you want to risk 1%, enter 1 to this input. If you want to risk 1.75%, enter 1.75 to this input. Base_Equity: The base equity that you want to separate from the rest of your account equity. 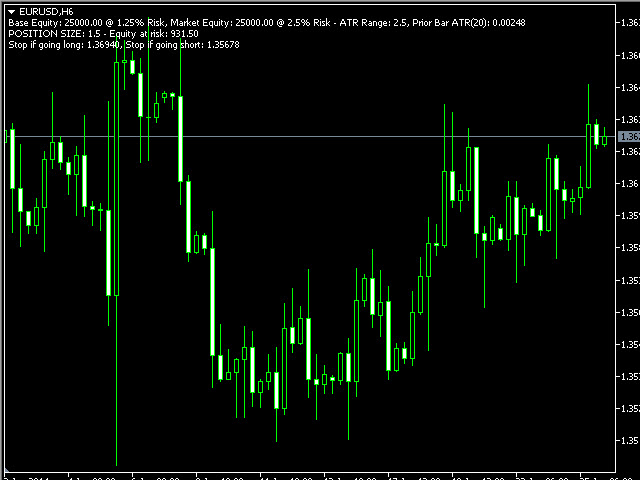 Market_Risk_Percent: The percent to be risked on the equity above your base equity. If you want to risk 2%, enter 2 to this input. If you want to risk 2.5%, enter 2.5 to this input. % Volatility Position Size accounts for volatility, equalizes or normalizes positions no matter the currency pair, and keeps losses small with the integrated stop. You can easily find out what your position size should be based on your chosen risk tolerances between your base equity and above. 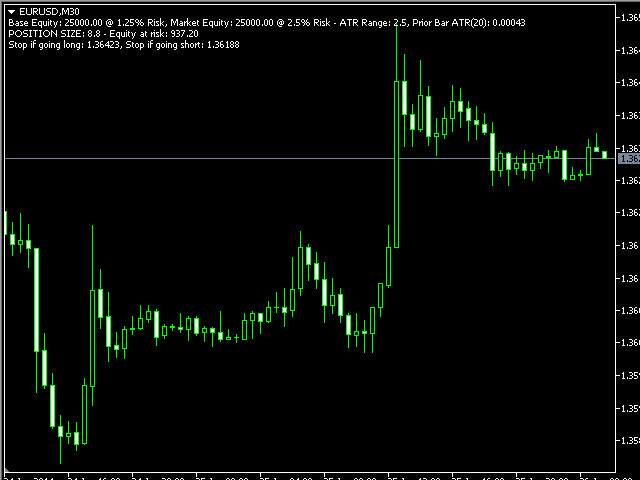 The calculation uses the value of each tick on the chart and calculates the value if the price reaches the stop price. Based on this value, the calculation completes to limit the position to the amount you are willing to risk. As volatility increases, the indicator will display a smaller position size. 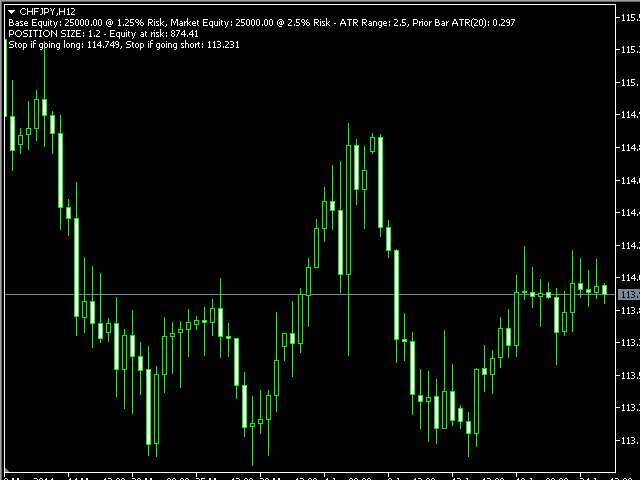 As volatility decreases, the indicator will display a larger position size. Also, percent volatility position sizing will increase the position size as your account size grows based on your risk and will decrease your position size if your account size goes through a drawdown. If the ATR value is too low (for example M1 or M5 chart), the position size will be larger than you expect and you will need to increase the ATR Range input.